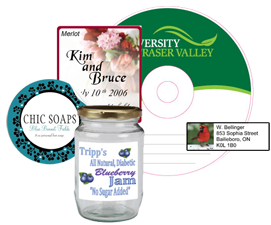 We print all sorts of Labels and Decals, everything from Return Address Labels to Wine Bottle Labels. We can also print on "Cling Film"; an electrically charged, printed, polypropylene film with an embedded static charge. It is removable and repositionable, contains no adhesives, and clings to most clean, smooth indoor surfaces..